"We sent a very stern protest to them indicating to them that we were very very much opposed to that course of action, that in fact we thought that they were retrogressing, that they were going back to the old days which we had long passed, and that we did not think that that kind of activity would in any way be helpful to developing the kind of confidence and trust between the two countries that are needed. They responded, and what they said essentially is that they did not, of course, share the position we took, that it was a backward step for them to be putting our country on the maps and teaching it to their children, and they explained that the maps were in connection with their own public information campaign to prepare their electorate for their upcoming referendum, and that the map has a dotted line which represents the adjacency line and signifies that their claim remains to be resolved. Of course Belize does not accept their position, and it is for this reason that we are proposing to resolve the matter at the International Court of Justice. The Guatemalans of course confirmed and reaffirmed that they will abide by the decision of the ICJ when it is given." That interview was conducted last week. Today, Elrington, is finishing a five-day working mission to the European capital of Brussels in Belgium. He participated in the 106th Session of the African, Caribbean and Pacific (ACP) Council of Ministers. 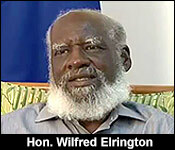 Elrington also addressed the Delegation for Relations with the Countries of Central America of the European Parliament. He updated DCAM on Belize-Guatemala relations, while raising other issues. He also met with the Managing Director for the Americas of the European External Action Service to speak about the EU's ongoing financial support for the OAS Office in the Adjacency Zone - among other matters. A government press release notes, quote, "Importantly, at the conclusion of the 106th ACP Council of Ministers, the Council adopted a Resolution reaffirming the 79 ACP State's strong commitment to the territorial integrity and sovereignty of Belize, urging the Government of Guatemala to comply with its formal agreements to formulate a Sarstoon River protocol with the Government of Belize."